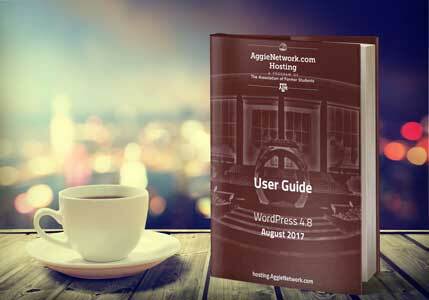 The latest version of the AggieNetwork.com Hosting User Guide will guide you through everything you need to know about managing your organization’s WordPress site and extra features included with your AggieNetwork.com Hosting account. We do not recommend printing the entire guide as it is updated rather frequently. You may access the interactive version of the guide here. Please delete any old or obsolete versions from your computer.